GPS Tracker in the Car and how to remove? Thread: GPS Tracker in the Car and how to remove? Did you ever find this? Bro, that is complete BS. They lied to you. I've been selling Kia's for 17 years and Kia does NOT track their customers for any purpose. Period. If a dealer install's something, it's either because you bought it or for their own personal reason. That is NOT a Kia function. Keep track of your Kia—even if you’re not driving it. The Find My Car feature offers peace of mind even if a family member is using the vehicle." The Geo Fence feature helps you keep tabs on your Kia—no matter who’s driving it. Geo Fence will alert you if your Kia is driven outside the pre-determined area you’ve set." If you can track your car via a built in system then so can Kia. The dealership doesn't care if your car is stolen. Once you sign the papers and financing is finalized it's the property of the bank and maybe yourself. If the stealership put a GPS tracker in there then it's maybe a thing for them to track if one of the cars is stolen off the lot or possibly a lease issue. Back in the day dealerships had all sorts of hidden fees, a GPS tracker could be a hidden fee and you didn't see it in the fine print. So, I wanted to address your comments here. These features are NOT functioning through a GPS sensor in the car. They are functioning via a GPS sensor in your cell phone. Those UVO functions will NOT function without having your phone tethered via the USB connection and synchronized. 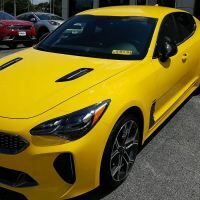 Now, if you live in a country that has the EMBEDDED UVO system in the Stinger, at that point the car has a FACTORY GPS receiver that communicates to report where your car is located. I just found this exact tracker hidden in my dash. I was looking at the fuse panel under the steering wheel and saw 2 wires spliced into the back of the OBD2 port and followed them up to the hidden tracker. I’m seriously feeling violated, and not in a good way. This is a serious betrayal of trust from a company that has sold me a product. Betrayal of my trust that I bought a new, unmodified product. Betrayal of trust with undisclosed tracking of my product. If there was ever a legitimate and legally allowed reason for it, then it should be clearly disclosed in writing at the time of sale, along with a plan for removal when conditions are no longer valid for the device to be active. A secret tracker from a seller is never in the buyer’s best interest. It’s downright evil. If it has to be secret, it has to be against the buyer.